HOTA is a presumed consent scheme. It allows for the corneas, heart, kidney, and liver of all Singapore citizens and Permanent Residents (PRs), 21 years and above, who have not opted out of HOTA and are not mentally disordered, to be removed for donation upon death. The Act was first enacted in 1987, before which the deceased donor kidney transplantation in Singapore was only about five per year. Initially, it allowed only for the kidneys of all non-Muslim citizens and PRs between the ages of 21 to 60, to be donated in the event of accidental death for transplantation. This was amended in 2004 when the regulation of all living-donor transplantations in Singapore was also included under the purview of HOTA. The Act's reach was extended to include liver, heart and corneas, and all other causes of death along with accidents. It was amended again in August, 2008, to include all Muslim Singapore citizens and PRs who were earlier excluded from the Act. Most recently, on November 1, 2009, the upper age limit of 60 years was also removed to give HOTA its present shape. Apart from efforts through Live On, which MOH hopes “will go beyond educating the public about HOTA as it aims to build up societal consciousness and acceptance of organ donation as an acceptable, generous act of goodness after one's death”, the ministry also “informs the general public of HOTA twice a year through the main local newspapers in the four official languages”. The history of organ transplantation in Singapore dates back to 1970 when the first cadaveric kidney transplant was performed. Later, on July 6, 1990, a team of doctors from Singapore General Hospital successfully carried out the first heart transplant here. The donor was a fatal industrial accident victim, while the recipient was a 59-years-old suffering from terminal heart disease. Soon after that, on September 29, doctors from the National University Hospital performed Singapore's first liver transplant on a female production worker. Now, the National Heart Centre performs all deceased donor heart transplants in Singapore and provides post-transplant care for recipients. Also, while Singapore started lung transplant programme in 2000, only 9 lung transplants have been performed till 2009 due to the strict medical criteria and suitability of lung donors. The MOH sends letters to all citizens and PRs when they turn 21 to indicate their inclusion in HOTA. Such letters are send to all new citizens and PRs as well. They are also informed about their option of opting out and its implications through these communications. Regarding implications on opting out of HOTA, MOH informs that “anyone who opts out of HOTA receives lower priority on the organ transplant waiting list should he require an organ transplant in the future. This will be specific to the organs which he opted out of”. 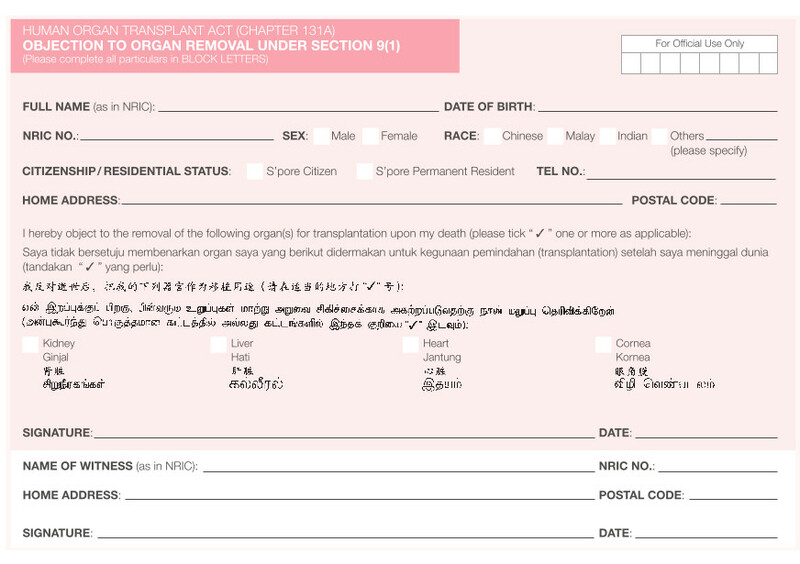 The MOH has established a National Organ Transplant Unit, which oversees organ donation and transplantation activities on a national level and maintains the organ donor registry. The MOH also mandates that every organ transplant must satisfy two major criteria. Firstly, there must not be any financial inducement or emotional coercion involved while donating an organ. And secondly, the donor must be thoroughly briefed on the nature and consequences of the medical procedures involved in the transplantation. Besides HOTA, which is a “presumed consent” scheme, Singapore also has an “opt-in scheme”, the Medical Therapy, Education and Research Act (MTERA). Under this, people who are 18 years old and above can pledge to donate their organs and tissues (for example kidney, liver, heart, cornea, lung, bone, skin, heart valves, etc.) for transplantation, education or research upon death. This Act also gives family members of the deceased the right to donate his or her organs under MTERA upon death if they wish to do so. While HOTA covers only the corneas, heart, kidney, and liver, for the purpose of transplantation, MTERA' scope is extended to all the body parts. MTERA also includes other purposes such as education and research along with transplantation under its ambit. But despite all the above efforts, about 516 patients [457 for kidneys alone] are currently on the wait list for organ transplants in Singapore. The median waiting time for a kidney transplant was 9 years in 2009. In 2012, 22 patients died as they didn't get a suitable organ match, and 57 were taken off the list as their condition worsened and they became unsuitable for a transplant. Note: All information in this story is courtesy MOH and its awareness portal on HOTA, Live On.